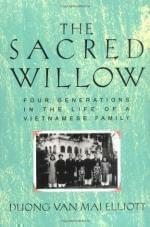 A finalist for the Pulitzer Prize, Duong Van Mai Elliott's The Sacred Willow illuminates recent Vietnamese history by weaving together the stories of the lives of four generations of her family. Beginning with her great-grandfather, who rose from rural poverty to become an influential landowner, and continuing to the present, she traces her family's journey through an era of tumultuous change. She tells us of childhood hours in her grandmother's silk shop, and of hiding while French troops torched her village, watching while blossoms torn by fire from the trees flutter "like hundreds of butterflies" overhead. She makes clear the agonizing choices that split Vietnamese families: her eldest sister left her staunchly anti-communist home to join the Viet Minh, and spent months sleeping in jungle camps with her infant son, fearing air raids by day and tigers by night. And she follows several family members through the last, desperate hours of the fall of Saigon-including one nephew who tried to escape by grabbing the skid of a departing American helicopter. Based on family papers, dozens of interviews, and a wealth of other research, this is not only a memorable family saga but a record of how the Vietnamese themselves have experienced their times.